I’ve been playing Fallout 4! But chances are if you’re reading a gaming blog, you have been too, judging by the rest of the attention I’ve seen this game get on WordPress. I just started it last Saturday morning on PC. I’ve been playing for ~15 hours, but I feel like I’ve only just scratched the surface. So far, I’ve only had one serious bug to contend with, but I was able to fix that pretty easily after some snooping on the Steam forums. When I started the game, I experienced some pretty severe stuttering whenever I moved the camera. It actually started to make me motion sick, which never happens to me in games. I found out that if I ran the game in windowed mode as opposed to fullscreen, the issue went away completely. I now run the game in a *borderless window* that takes up the full resolution of my monitor…..i.e. exactly the same thing as full screen…. and it is a silky smooth experience for me. What an absurd fix to an absurd problem. Otherwise, I haven’t encountered any serious bugs. I’ve clipped through a door into an area that I don’t think I was meant to go into, and I’ve seen things like a radscorpion freeze mid-animation when popping up out of the ground. All these bugs are just the goofy kind. I fortunately haven’t encountered anything game breaking, yet. I’ve heard some people say this game looks just like Fallout 3 on a technical level, which I find utterly absurd. I think we’ve reached a point where many people are forgetting what 360/PS3 games actually looked like. But I will say, it’s not the most visually impressive game of the last year or so, but it’s nowhere near Fallout 3-level visuals. A lot of people were very down on this game when it launched, but since this hasn’t been a particularly good year for 3DS releases, I decided to pick it up so I would have something to play on the handheld. I was actually quite surprised. With all the negativity surrounding the game, I was impressed that I took to the game as quickly as I did. For those that don’t know, Tri Force Heroes is a 3-player co-op top-down Zelda game. And by 3-player co-op, I mean 3 player co-op. Notice the game is called Tri Force with a space. It’s not possible to play with only two players. If a member of your trio drops out mid-game, then both of the remaining players are kicked back to the game’s matchmaking lobby. It’s possible to play it single-player, but in this mode the player has to swap control between the 3 characters. The ones the player isn’t in control of have no AI whatsoever and just stand in place. I only messed around a little bit with the single player mode and felt that it was rather tedious, so I stuck with online co-op. This strict 3 player requirement makes sense in light of the game’s heavy puzzle emphasis. The game is divided into 8 worlds (of course) and each world is divided into 4 levels. At the start of a level, the players must each pick up one of the three items (i.e., boomerang, grappling hook, etc.) that are needed to complete the level. Each player can only carry one item, and teamwork is required to solve the many puzzles that fill each level. If there were only 2 players giving it a go, then the most of the puzzles would be unsolvable. I was actually a bit surprised that they went for such a heavy emphasis on puzzles, when they could have went the easy route and made it a combat-focused game that wouldn’t have required as much teamwork. This is where I thought the magic of the game really shined through. Right off the bat, I was having a great time figuring out how to work with my team to use our items to progress. I got a really glowing feeling each time everything finally clicked between us, and we worked out how each of our items figured into the obstacle at hand.. I’m surprised so many other people whose thoughts I’ve read on the game didn’t feel the same way. Also, I fortunately didn’t encounter as many troll players as I feared. I encountered one player who immediately began picking me and the other player up and would throw us off cliffs. I disconnected from that quickly. Fortunately, he started trolling us right away at the beginning of the level. If he had waited until we were deeper into the level to show his true colors, he would have wasted a lot more of my time, because when you disconnect from a game, you have to start the whole level over again (and these levels can take ~30 minutes to beat sometimes). There was one other player who I think might have been a troll, but I couldn’t say for certain. If he was, he was impressively subtle. He kept walking off ledges into pits, which is a problem since all players share the same life bar. But he would only walk into a pit when he had “plausible deniability”. He wouldn’t just walk off at random times. For instance, when a moving platform was coming, he would *always* walk off the ledge toward it just a moment too early or too late. And he did this *a lot*. I eventually decided that no one could be this bad at the game and disconnected since the team was down to one heart and on our last life anyway. Regrettably, the magic of the game didn’t last. I was really enjoying Tri Force Heroes for the first five worlds, but the final three are really hard. At a certain point, it became more tedious than joyful. The levels are fairly time consuming, and if your team loses all four lives they’ve been granted, then the entire level must be redone from square one. Considering the difficulty of the final stretch of the game, it ended up becoming a very repetitive affair for me, as I had to give several levels multiple attempts. I honestly don’t think such repetition suits the game considering it causes the player to have to grind on the same puzzles they’ve already solved in previous attempts. I don’t think I’ll ever really beat Tri Force Heroes, unfortunately. After several attempts with multiple teams, I only managed to reach the final boss once in the final level. And I didn’t even get to fight the boss because a connection error popped up almost as soon as the fight started. As you can imagine, I was quite frustrated. I soldiered on afterwards, but none of my subsequent teams even got close to the boss. Eventually, I relented to my annoyance with the whole thing, and I’ve put the game away. It’s been quite a disappointment in light of the blast I was having during the first half of the game. Some of you who read my blog regularly may remember that I bought a Dreamcast over the summer. 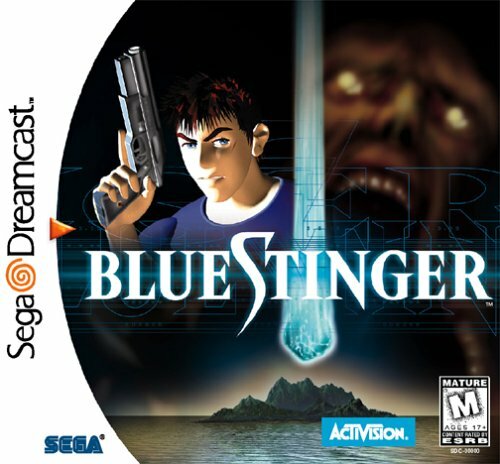 For my run of horror games that I played over October, I wanted to include a Dreamcast title and decided on playing a somewhat obscure game called Blue Stinger. Actually, I had wanted to play Ill Bleed, but that game was way too expensive on ebay. I decided on Blue Stinger instead, as it’s by the same producer and I vaguely recall reading about it around the the time of the Dreamcast’s launch. Long story short, I didn’t make a post about Blue Stinger since I found that it wasn’t much of a horror game. I’ve found out that some people categorize it as such, but others don’t, and I find myself agreeing more with the latter group. The enemies certainly look like something out of a survival horror title, but that’s as far as it goes. There is no real atmosphere to this game, as I’m not sure if it’s even supposed to be a scary. The game’s environments are rather brightly colored and punctuated by this very jaunty and orchestral background music. Anyway, I only bring this up on the off-chance someone who reads this may have played the game. I’m not sure if I’m going to play much further than I have already (about an hour in), and I wanted to know if the game is worth completing. Well, that’s all I have to discuss for now. Thanks everybody for reading. The final game of The Maximum Utmost’s Halloween Gaming for 2015 is here! Stasis is a point-and-click adventure game that released just a short while ago on Steam. An isometric adventure game with “inventory”-type puzzles, Stasis leans heavily on a disturbing and shock-ridden atmosphere to lay claim to its horror roots. The game was actually a fair bit longer than I expected, and that’s why, unfortunately, this post didn’t make my Halloween deadline for it. In Stasis, the player wakes up as John Maracheck, a man who has been in cryostasis for an unknown amount of time. The last thing John remembers is entering stasis with his wife and daughter as they embarked on a vacation to Jupiter. John now finds himself in orbit of Neptune in a derelict research vessel that has been overrun by the vile products of the human experimentation that had been carried out by the now deceased and slaughtered crew. Setting out to find the whereabouts of his wife and daughter as well as a means of escape, he’ll have to face the grotesque abominations of science that call the ship home. 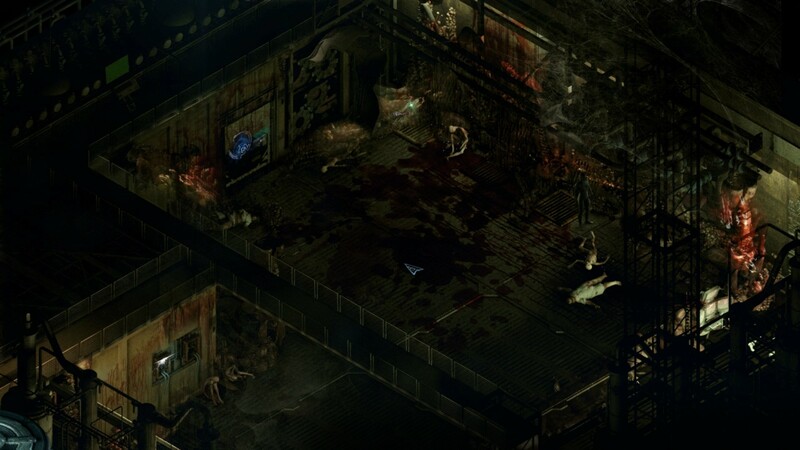 Stasis is heavily inspired by an old isometric PC adventure game called Sanitarium. I think when most people think of old isometric PC games, they usually associate this type of perspective with RPGs like Baldur’s Gate, Diablo, Icewind Dale, etc., but Sanitarium was interesting in that it was actually a point-and-click adventure game in the vein of Monkey Island or Sam and Max. It was a game that lacked combat, but instead focused on puzzle solving mainly around creative problem solving using items (and combinations of items) found in the environment. I’ve never played Sanitarium, but after reading about it, it actually sounds pretty cool, so I may give it a shot sometime. Stasis shares a lot of common factors with its inspiration. The gameplay is focused on finding items and figuring out how to use them to overcome obstacles that block progression. And the stories of each game kick off in a somewhat similar way with protagonists who are “waking up” in a setting where things have gone terribly awry without any memories of how they got there. But the key commonality between Stasis and Sanitarium is their focus on psychological horror (which in some ways is a natural consequence of the puzzle-focused gameplay chosen). There are no enemies in this game to fight or run and hide from like in most other horror games. There’s no combat of any sort, and there’s no enemies that will ever really kill the character in this game. It’s possible to die, but this happens only occasionally when the player screws up a puzzle, rather than it being the result of an action actively done to the protagonist. Instead, the tension and dread of this game originate from the intensely disturbing and unnerving imagery and scenarios that play out as the player progress through the starship. There’s some really shocking and depraved stuff that the player will see during this game, and these disturbing discoveries are the main driver of the horror aspects of this game. I found that the game definitely delivered when it came to macabre and grotesque scenes that I won’t forget for some time. But the focus on shocks rather than scares is both what makes the game unique, but also what leaves it being rather uneven and poorly paced at times. Considering he’s on a ship that was overrun by mutated creatures that slaughtered the crew, it’s odd that John Maracheck never really finds himself in a situation where he directly encounters these monsters. He certainly witnesses the gruesome aftermath of the massacre of the crew, as well as the perverse experiments that were being performed by the ship’s depraved science team. But I never really felt like he was in danger. I understand that this is a game focused on puzzle solving rather than action and combat. But as I felt that John was never in any real danger, I think it created a disconnect between my reactions to the game’s events and John’s increasingly panicked and emotional state. To elaborate further, I found the character of John Maracheck to be frustratingly intrusive sometimes, especially toward the end of the game. When arriving at an unsettling scene, I would begin to start taking in the grotesquery that I was witnessing, only to be interrupted by John loudly panicking with weeping and wailing and insipid cries of “How could they do this!?!? !” and other such trite comments. Given his situation, I perfectly understand why he is so emotional throughout the game. My problem is that I find that his reactions disrupt my reactions to the disturbing things that play out in this game. They’re more distractions to me as I try to fathom and process exactly what it is I’m seeing. Imagine if Jill or Chris started freaking out everytime they came across a zombie or some new horror in the Spencer Mansion. I think it might have been a better choice to have John be a silent protagonist or to only give his feedback during the game’s particularly troubling scenes. The other issue I have is that the game is rather uneven and poorly paced. There is a large stretch in the middle of the game where nothing particularly interesting happens. This occurs in the crew and medical quarters. I think the player is supposed to be appalled by all the dead and desecrated crew found in this section, but it just fell flat for me. The game starts picking up in a big way when the player reaches the labs, but, unfortunately, I think the long, unnecessary, and forgettable middle sections made me grow tired of the game just as events were starting to pick up toward the climax. As a result, I was beginning to feel that the game was overly long during the parts I should have been the most engaged with it. Another major pacing complaint that I have is that the game is filled with TONS of text logs. I really really hate to sound like some sort of illiterate here, but I think a lot of these text logs needed to be trimmed out. Almost all of them are overly long with no concision to be found. And more than a fair few of them are filled with mundane details about the crew that don’t really enhance the story in any meaningful way. I understand that the writer of the game probably wanted to establish the crew as real people so that the player would feel terrible for what happened to them. But I really felt that all the tedious details that were given to the lives of some of the dead crew just disrupted the pacing of the game. Unfortunately, the game establishes very early on that sometimes these text logs contain important pieces of information that are necessary to progress, so I felt compelled to read everything I came across, regardless of my dwindling patience for it. That said, there’s some really great and disturbing material in these text logs, particularly when the player reaches the labs. And the writer(s) actually do a good job of slowly revealing the extent of the depravity that was occurring on the ship via these logs. But I feel like at least 50% of it could be cut out without detriment to the player’s understanding of the story. While I have issues with the back loaded nature of Stasis, I do think the people behind the game succeeded at what they set out to do with the game. It also makes me very curious to try Sanitarium. For players looking for a traditional survival horror experience, I don’t this is the game for them. Afterall, the monsters are very much a detached part of this experience. But if you like point-and-click adventure games with dense atmosphere, I think you’ll jive with Stasis despite its pacing flaws. I found the puzzles to be well-designed, not too easy, but not too hard. The solutions weren’t always immediately apparent, but they always made sense to me, and I was never so stumped and frustrated that I needed to consult a walkthrough. I just feel that with some trimming or tweaking of the less impactful parts of the game, Stasis could have been much more of an indie gem.